Would you like a camisole with a built in nursing bra? Carriwell have designed this White Seamless Nursing Control Cami to help make your life easier; instead of having to wear a top as well as a nursing bra, this Cami covers both! Based on the multiple award-winning Carriwell nursing bra, this camisole is really practical. It is made of a light, breathable fabric, with an integrated support for your breasts. The nursing bra part of this camisole has all the things you look for in a good nursing bra; easy, one-handed maternity clips that allow you to drop the cup without struggling, and adjustable straps to make sure you get the best fit possible. So what about the support? This cami is designed to gently shape and support your midriff whilst you are nursing your baby. It should help to give you a shapely appearance, offering you confidence after the birth of your baby. This has the added advantage of keeping your tummy warm when you feed! This Carriwell Seamless Nursing Control Cami is available in four sizes; Small (designed to fit Bra Size 32-34), Medium (designed to fit Bra Size 36-38), Large (designed to fit Bra Size 40-42), and Extra Large (designed to fit Bra Size 44-46). This Cami is machine washable at 40 degrees, a useful feature with a young baby around! If you would like a different colour, this cami is also available in black. 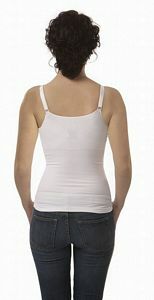 So why would we recommend this White Seamless Nursing Control Cami from Carriwell? We believe that the built in support and gentle shape control makes this cami a nursing essential, offering you confidence and practicality at the same time!